by Dave from The Longest Way Home ~ June 17th, 2014. Updated on December 2nd, 2016. Published in: Travel blog » Thailand. One of the strange things about writing a month in advance is that things can change in the blink of an earthquake. What used to be a huge and popular tourist destination can literally be wiped off the planet overnight. 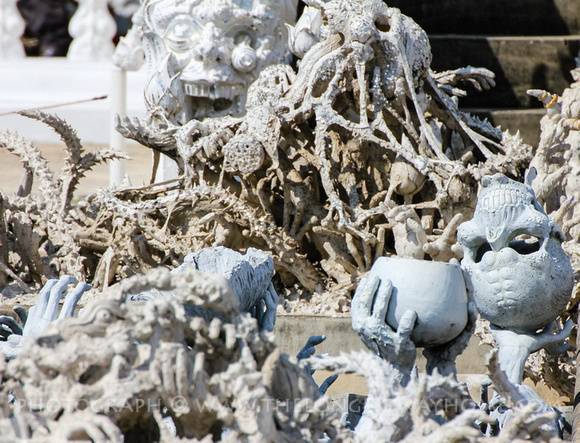 While not completely wiped out the White Temple in Chiang Rai was severely damaged during an earthquake on the 5th of May 2014. So much so it’s no longer possible to visit inside the temple. I stayed in Chiang Rai before the earthquake so I was able to visit this temple fully. Here’s a look at what was the White Temple, what’s it like now and what is to become of the temple. 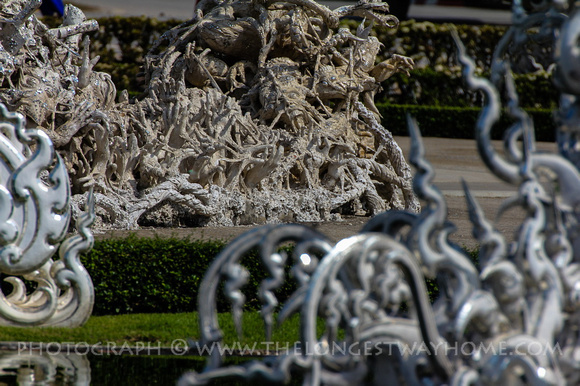 The White Temples full name is Wat Rong Khun. 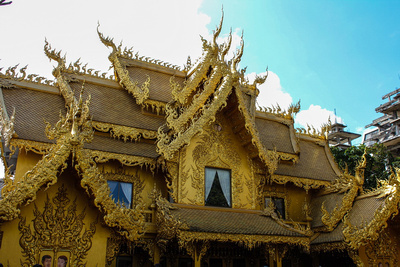 It is an unconventional Buddhist temple that began construction in 1997 by a wealthy Thai artist called Chalermchai Kositpipat. Kositpipat has funded the temples construction himself as it’s come under scrutiny by many both in the government and in the Thai Buddhist community due to its graphic representations. The main building is painted white to symbolize Buddha’s purity while mirrored tiles and mosaics made from mirrors decorate it outside. 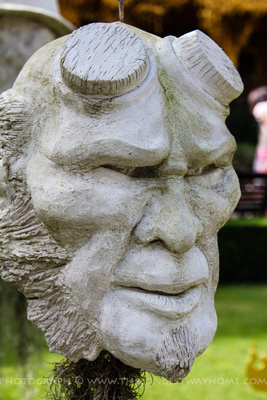 Surrounding the main building are detailed sculptures of serpents, demons, skulls, severed heads along with an area filled with arms and hands reaching out from what can only be thought of as some form of torment in the ground. Some people say the hands represent greed and twisted faces are demons mocking people as they leave greed behind and walk towards the purer teachings of Buddha. The White Temple is by no means an ordinary Thai Buddhist temple as you can see. 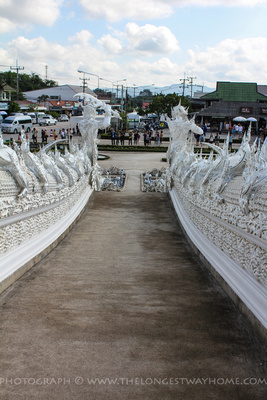 As you enter the compound (literally beside the road) you’ll see a bridge leading up to the main White Temple. This is symbol of a bridge from hell to the temple itself. Or according to another source a depiction of greed and those walking the bridge are leaving it behind. Take your pick! The white temple is said to represent the mind while to it’s left is a golden temple that is meant to represent the body. One should only go up the bridge to the temple and never down. Going down means descending into hell. Bridge leading to the White Temple: remember to walk up and not down! Crossing over the bridge and into the temple one is surrounded by giant Buddhist murals with modern twists that involve the appearance of characters from movies such as Star Wars and the Matrix. Also depicted are scenes such as a plane crashing into the twin towers and the planet earth being devastated by a catastrophic event. It’s different, very abstract but not so bizarre as one might think. For me though the real treat is the White Temple itself – from the outside. Sadly even on my visit much of the temple was cordoned off for building work so it was hard to go anywhere other than around. Nevertheless it’s still a visual treat for the eyes around the temple grounds. On the 5th of May 2014 an earthquake (6.3) hit nearby Mae Lao that severely damaged the White Temple in Chiang Rai (27 km away). At first the damage seemed superficial with only mosaics and paintings being damaged. However as aftershocks continued and a surveillance team visited the temple it became apparent that the damage was a lot more devastating. Murals collapsed and supporting pillars were damaged beyond repair. Chalermchai announced that the temple would not be rebuilt and it was to be closed for good. People say time heals. In the case of ruined buildings this may not be true. But in terms of human resolve it might well be true. Chalermchai has now stated that work on repairs has already begun. While the White Temple’s interior may be closed visitors can still visit and walk around the outside of the temple. Which again, is perhaps, its most interesting part. Chalermchai has admitted it will take about 2 years to repair the earthquake damage to Wat Rong Khun. Repairs are already on the way. Considering the temple itself is not scheduled to be completed until 2070 … that’s not too harsh. 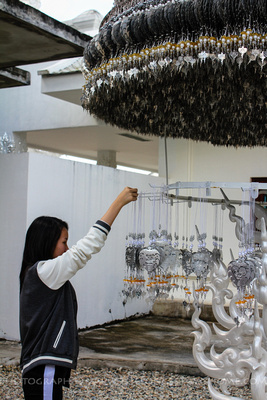 “Only death can stop my dream, but cannot stop my project,” Chalermchai. Again, the White Temple can still be visited today. It’s free to enter the grounds. you just can’t go inside. Train: There’s a train to Chiang Mai from Bangkok but it does not go to Chiang Rai, so you’ll need to take the below bus from Chiang Mai to Chiang Rai. Bus: To visit either make your own way to Chiang Rai via main bus. From Chiang Mai it’s about 3.5 hours. From Bangkok it’s 11-12 hours from Mo-Chit bus station. 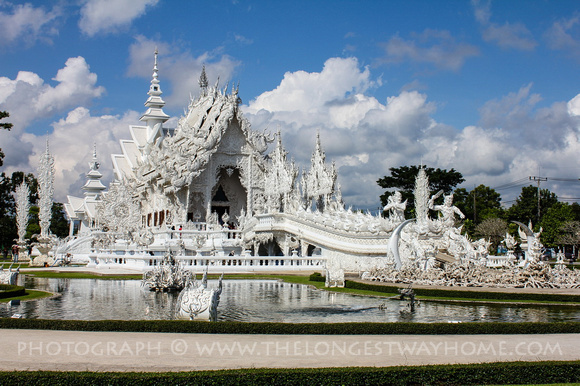 Local Bus: From Chiang Rai bus station take a local bus south (13 km – 30 mins) to Wat Rong Khun. To get back simply wait the opposite side of the road for buses going back to Chiang Rai. 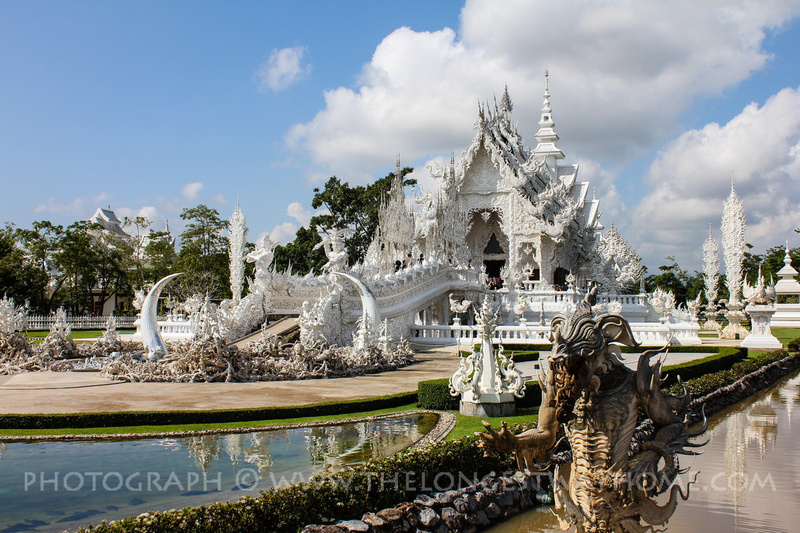 Tour: You could also book a tour from Chiang Mai to the White Temple for about 500-700 baht. Just be warned that it does get crowded there as all the buses seem to arrive at the same time. Drive: Lastly you could just hire a motorbike are ride to the White Temple yourself if you are touring North Thailand. The roads are good and most traffic signs are in English and Thai. I do advise you carry some form of GPS and or map though just in case. Note: If you are completely “templed out” by wats in Thailand then make the White Temple an exception: it’s far different from any other Buddhist temple out there. Planning on booking a hotel room in Chiang Mai or Chiang Rai? Great to read an update about the white temple. We’ve not heard much about it since the quake. Thanks for letting us know we can still visit. Yep, it’s still open everyday! You just can’t go inside as they are repairing it. Awesome photos Dave. Glad to hear the temple is still open and it seems relatively sound after the earthquake. Hi Anna, it took some damage. But they are repairing it now. We were fortunate to have visited The White Temple on May 5th. and arrived back at our Guest House at 6pm just as the Earthquake struck. Lucky you to have seen the temple and then make it back as the earthquake struck. Glad you made it back safe! Nice update on what was one of the nicest things to do in Chiang Mai for a day trip. Good to know it’s still open. No problem. It’s actually just outside Chiang Mai in Chiang Rai. But you can do a day trip from Chiang Mai easily. Looks so beautiful on your pictures, thanks for the tip and sharing. Going to the area in October so will keep it on my mind. White Temple very amazing place for tour. I like this place but after 5 may 2014 earthquake have some cracks on pillars and walls. Your information about white temple is really helpful for anyone. Your post covered all type of information about white temple. I am thankful you for this post. Keep posting with this type of unique and complete stuff. Stunning photos. Never knew about this place until now. We’re going next year to Thailand so looking forward to reading more about it here. I had a chance to visit this place twice, but passed both times. Now I regret not going. Hope they are able to restore inner access soon! Excellent detailed information about the temple Its very useful…So glad to know about it. Does the temple is open everyday to the public after the earthquake last March? Is it safe to visit the temple? Yes it’s still open. The unsafe interiors parts have been closed off. But as most of the impressiveness is on the outside you can still see the majority of the complex.